Ever since we launched Google Calendar, people in our forum have been pretty vocal about a missing piece -- an integrated task list. "To-do would be tooo-rific," "I really, really, really need to use a to-do list," and my favorite: "I'll join your team to help you get it done!" The rumble turned into a roar a few months ago when we launched Tasks in Gmail Labs. 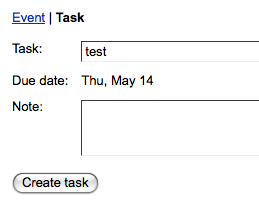 Now we've integrated Tasks into Google Calendar as well.